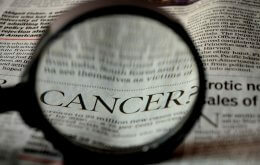 “Using the biomarker to detect oral cancer holds potential for saving lives when the cancer is most curable. Annually some 10,000 people die from this cancer,” said Ge Jin, assistant professor of biological sciences at the dental school. He led the study, “An Antimicrobial Peptide Regulates Tumor-Associated Macrophage Trafficking via the Chemokine Receptor CCR2, a Model for Tumorigenesis.” The Public Library of Science published the research in PLoS ONE. Oral cancer first appears as white or red lesions in the mouth, the same as noncancerous lesions. Often, the lesions are not biopsied, and cancer is not discovered until it becomes apparent in its later stages, when it has metastasized to other organs. Such a late-stage diagnosis is generally fatal and can result in costly surgeries and treatments or disfigurement that may include removing parts of the tongue, jaw and cheek. All this can be avoided with early removal of the lesion. The hBD-3 biomarker is one of many innate immune peptides found in the epithelial lining of the mouth. In a normal, healthy oral cavity, hBD-1, -2 and -3 ward off the hundreds of bacteria that constantly challenge the human immune system in the mouth. While hBD-1 and -2 are on the frontline defense, hBD-3 is only found in the basal layer where oral cancers grow. The researchers report that the hBD-2 disappears and only hBD3 is present when a cancerous tumor progresses. Jin added that the lone presence of hBD-3 made the research team question its role on tumor growth and found it attracts other molecules that actually help the cancerous tumor grow and eventually spread to other parts of the body. It appears hBD-3 plays a role in the development of the chemokine receptor called CCR2 that recruits tumor-associated macrophage cells to infiltrate the tumor site and stimulate tumor growth. The tumor-associated macrophages and other molecules release growth factors that encourage the progression of the tumor. Eventually tumor cells break away, travel and spread the cancer to other places in the body. “This is the first time that we have evidence that CCR2, too, has a role in oral cancer growth,” said Jin. The researcher plans to continue studying the role of hBDs in oral health and to develop diagnostic tools that use the biomarker to detect early cancer. Other project researchers are: Hameem I. Kawsar, Stanley A. Hirsch, Xun Jia, Santosh K. Ghosh, Zhimin Feng, Aaron Weinberg from Case Western Reserve University; Qing Yin Zheng from University Hospitals Case Medical Center; Chun Zeng and Aimin Zhou from Cleveland State University; and Thomas M. McIntyre, Learner Research Institute at the Cleveland Clinic College of Medicine of Case Western Reserve University.